The need for fire protection on the UC Davis campus was first recognized by the Dean of the College of Agriculture in 1917. Several hand-drawn hose carts were purchased and strategically located in sheds throughout the small school. At the time, fire protection service was 100% volunteer based, with groups of ordinary students and professors assigned to each cart. Whenever a fire broke out, a steam whistle on the Creamery Building (located where Olson Hall now stands) was blown to summon the firefighting volunteers. UC Davis Volunteer Firefighters deploy a master stream near North Hall. In the 1930’s, several small fires challenged the adequacy of this method. Fires such as the ones in North Hall, the dehydrator shed, and a small rubbish pile was quickly suppressed. However, two detrimental fires that occurred in 1938 made it clear to the University staff that more serious measures needed to be taken to prevent further damage and losses. In September 1937, the University worked directly with Mayor Calvin Arthur Covell Jr. of the City of Davis to incorporate an organized fire protection service on the campus. To organize such a service, the school purchased a 500 gallon-capacity fire pump, capable of pumping 400 gallons per minute (currently the UCDFD Engine 34 pumps 1750 GPM), for the only engine on campus. Unfortunately, the purchase of the new pump proved insufficient at 10:35 PM on Thursday, June 30, 1938, when the upper floors of the Soils and Irrigation building caught fire. The University Engine was the first to arrive on-scene, followed by the City of Davis Fire Department (led by Fire Chief John Miller at the time). Having suffered equipment related issues (such as a blown hose and combustion of the radiator), the University's engine created even more problems, and the upper floors of the building were eliminated. The fire was finally put out when the more established Woodland and Dixon fire departments arrived with better functioning equipment. Despite the efforts of the four departments, the building was lost, and damages totaled to approximately $35,000. The local newspaper, The Davis Enterprise, reported that “the University’s fire-fighting apparatus was insufficient and the equipment of Davis inadequate.” The University needed the help of the local county departments, ultimately setting a precedent for mutual aid. Four months later on the night of Monday, October 23, 1938, a fire in the Agronomy Seed House erupted. UCD volunteers were the only ones to respond but to no avail. While a heavy downpour kept the fire from spreading to other buildings, the university’s equipment was not sufficient to save the warehouse. Although no lives were lost, the fire cost UC Davis a decade’s work on its research and seeds, plus an additional $25,000 in damages for that fiscal year. Because UC Davis experienced an estimated $60,000 in fire-related losses alone in the year of 1938, the school began to plan the construction of a station for the Fire Department that November. The station would include a siren that could be heard within a one-mile radius, a new engine, and upgrades to the rest of the fleet (such as 1500 ft. of new hose) were made. More volunteers made up of the school’s students, staff and faculty were added to take calls at night in addition to operating the equipment during the day. UC Davis Fire Department's new Seagrave "Engine 4" pumping on house fire. By March 1939, the construction of the University’s first fire station had been completed. 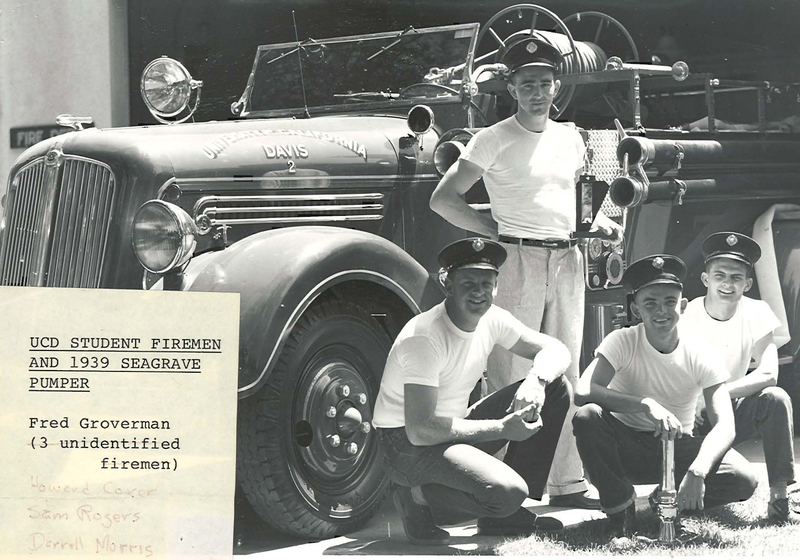 Moreover, the department received “Seagrave,” an engine with every available feature 1940’s technology had to offer, which was a rarity given the impact of WWII on the economy. The new station and “Seagrave” enabled UC Davis to satisfy the firefighting standards of that time. The new UC Davis fire station, along with its three fire apparatus and volunteers, met the fire protection service needs of the campus. Following a small fire in the heating oven on campus in May of 1939, Dean Knowles Ryerson sought the City of Davis’ Fire Chief John Miller to organize a formal training program that would enhance the performance and knowledge of the volunteer firefighters, as well as coordinate service methods between the departments. Comptroller Ira Smith put out a memo calling for more participants to become volunteers, bringing in janitors, gardeners, professors, lab technicians, and other campus employees. All of the University’s volunteers worked alongside the Davis firefighters throughout the ten-week program, undergoing both physical training and fire education. By the end of the program, the University had a trained volunteer firefighting team of 20 men. 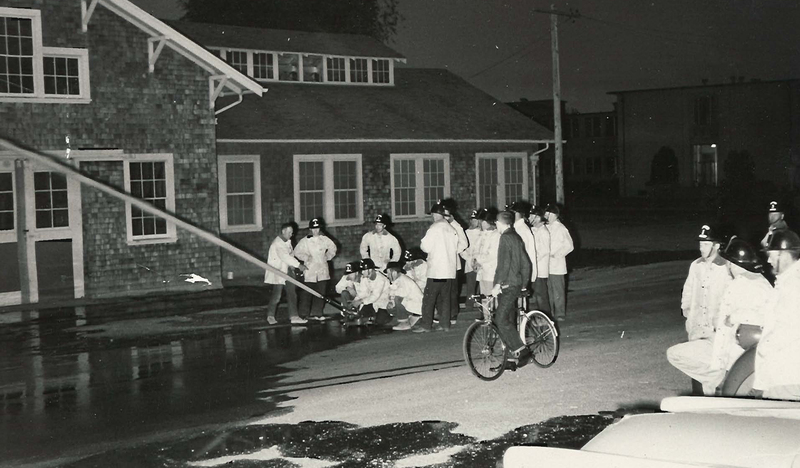 In 1949, the University department began its Student Resident Fire Fighter Program. The program, which was designed to teach firefighting skills to a select group of UC Davis students, became one of three in the entire country (the others are at Clemson University and the University of Alaska at Fairbanks). UC Davis Student Firefighters hold trophy from "Firemanship" competition. The SRFF Program made it possible for students to receive hands-on training and professional experience in all aspects of fire and emergency services. The implementation of the program was the first step in adding working members to the UC Davis Fire Department, though only upon completion of a rigorous physical abilities test, an intensive interview process, and a firefighting academy. Each student was (and still are today) required to staff one 24 hour shift, four 14 hour shifts, and two training sessions per month, demanding a commitment not generally associated with college life. Also, each student was (and still is) expected to represent the University and the Department while on duty; as such, they are provided with uniforms, personal protection gear, and training designed to meet that end. 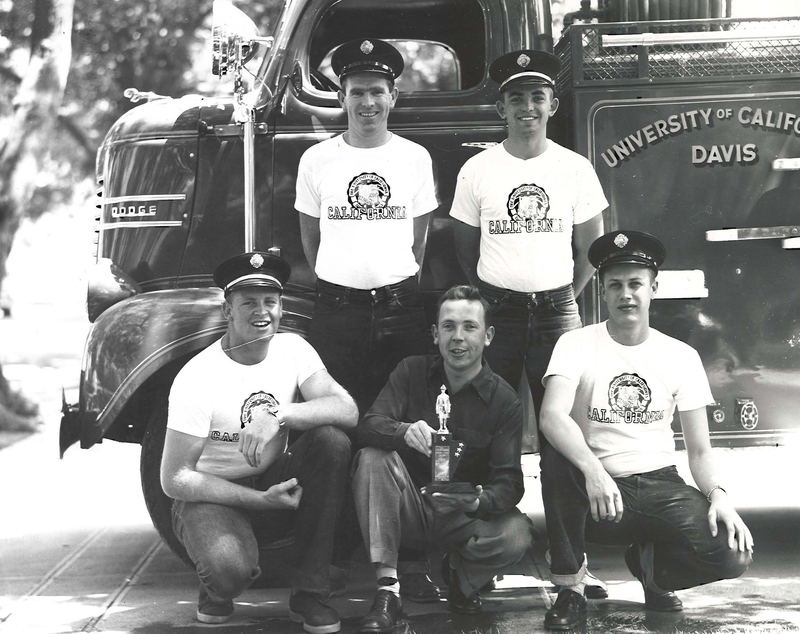 In 1955, UC Davis began hiring career firefighters to work alongside the Student Resident Fire Fighters. In 1959, Charles Prather replaced volunteer Chief Leonard McKinnon and was hired as the department’s first career Fire Chief. By 1974, the potential complexity of problems posed by the developing research campus reached a magnitude that required a higher level of training and a constant 24-hour commitment. As a result, all of the volunteers unable to meet such criterions were disbanded. UC Davis Fire Station 34, located as it is today at 625 Kleiber Hall Dr. 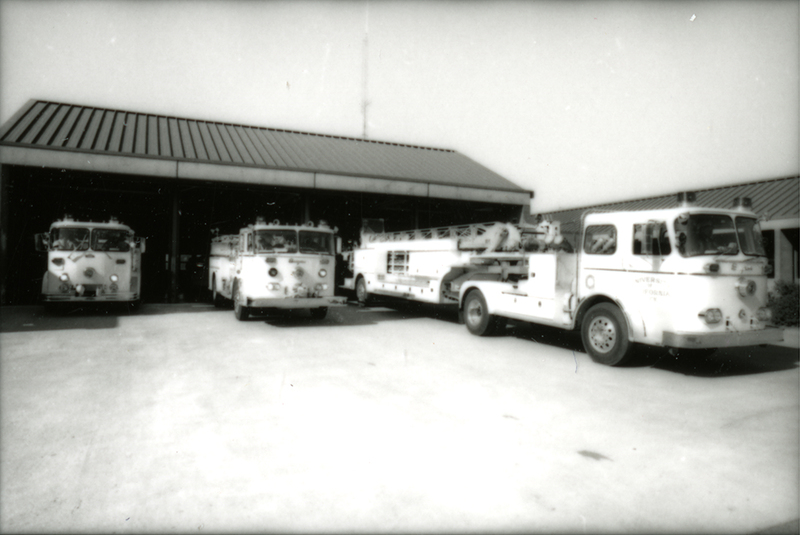 In 1977, the new UC Davis fire station was built and began to house the career firefighters. This adjustment reflected the department’s mission to better serve and protect the campus community at any and all hours of the day. Today, the UC Davis Fire Department takes a progressive approach to all aspects of service. Our highly qualified staff, state-of-the-art equipment, rigorous training, and fire prevention programs allow us to alleviate emergencies far beyond the realm of possibility in 1917. 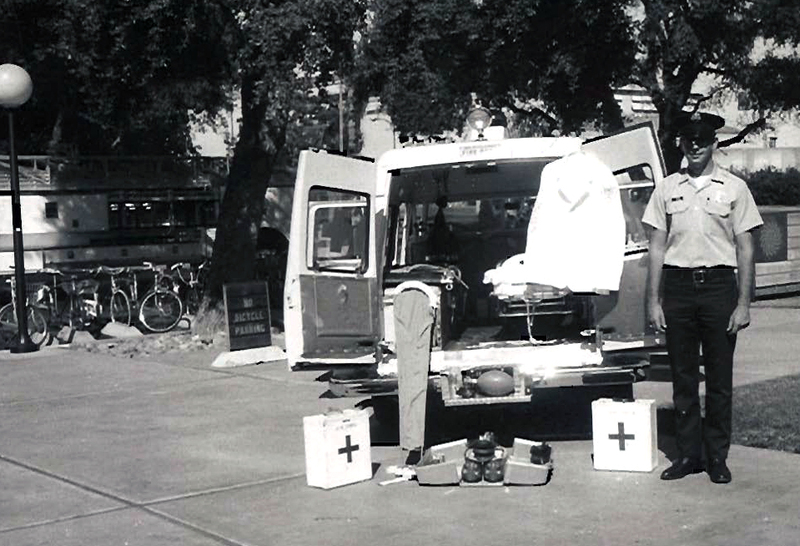 From 1940's through the 1980's the UC Davis Fire Department provided ambulance transport for students, staff, faculty, and visitors to the UC Davis Campus. The Student Health Center was a certified emergency department, which meant it was the destination for the sick and injured that the fire department responded to. It wasn't unusual for nurses and other Health Center staff to respond to the emergencies with firefighters. 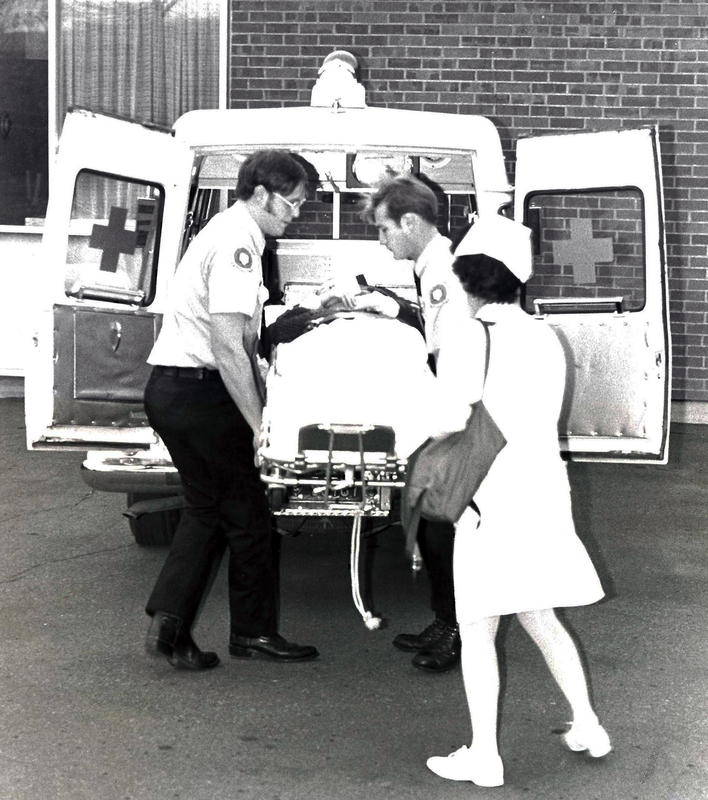 An early version of what today is known as mobile integrated healthcare. UC Davis Firefighter Stands next to a UC Davis ambulance. UC Davis Firefighters and Student Health Nurse load a patient into the back fo a waiting UC Davis ambulance.